DHBC's Committee established the MPD Initiative in May 2018, grassroots advocacy focussing on enforcement of Minimum Passing Distance. This was grounded in a Strategic Plan, which mapped out a series of positive and constructive actions. The objective is to significantly raise public acceptance and Police enforcement of the Minimum Passing Distance road rule in NSW within two years. Minimum Passing Distance is now getting a higher profile, with momentum continuing to build six months into the MPD Initiative. Our Club is being recognised at the forefront of Cycling Road Safety. There is broad and growing support for better awareness and enforcement of Safe Passing Distance. This online petition was launched in mid-late August, and has been a huge success. It has brought together a very diverse range of cycling groups (Bike Clubs, BUGs, representative bodies, online forums and peak advocacy organisations), as well as concerned citizens and ordinary bike riders. 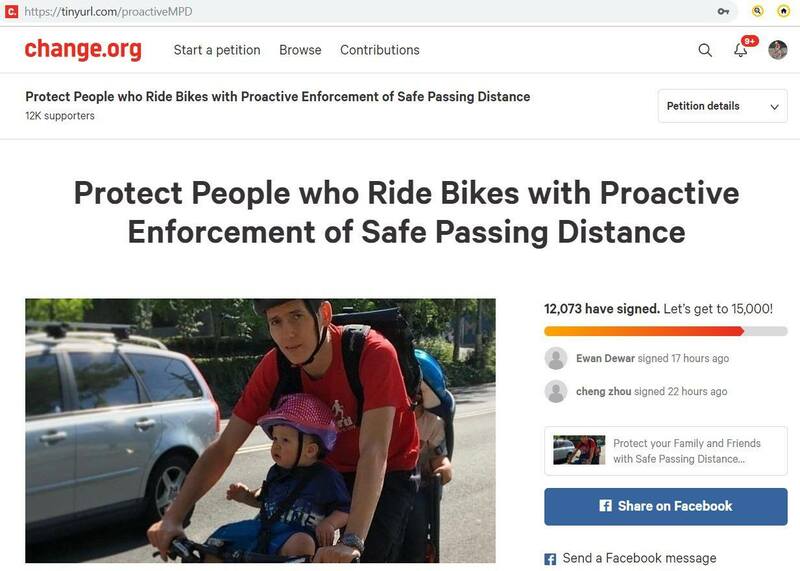 The Petition for Safe Passing Distance has achieved twelve thousand signatories in less than four months, and features moving comments from 1,100 supporters. We have been holding stalls at events such as the Marrickville Festival and Big Bike Day. These outreach activities go beyond “preaching to the converted” by making Road Safety real and personal. They include a lot of good two-way conversations about sharing the road. Also helps to promote the Club and sign-up new members. September featured the Inner West Council's Big Bike Day at War Memorial Park, Leichhardt. While the Marrickville Festival was a highlight of October, promoting the Club and reaching out to our local community. These events have showcased the MPD exercise from Bicycle NSW, plus encouraging people to sign the Petition for Safe Passing Distance as well as writing letters to their Local MP. Many Club Members use video recordings of their rides, such as the front and rear cameras from Cycliq (which integrate lights along with High Definition video cameras). We promote greater usage of safety equipment by Club Members and by all cyclists (cameras, lights, high visibility clothing, etc). Two Club Members have built their own ultrasonic devices, to measure the distance between vehicles and bike riders. We have also been trialling a Close Pass Detector (CPD) from Cyclist Tom of YouTube fame. The CPD has been built from components that cost only $100-115, compared to $2,000-3,000 for commercial units! An ultrasonic sensor on the handlebars is connected to a display unit, where the passing distance is shown for 10 seconds. The CPD has been on half a dozen group rides, to give Club Members a chance to see it in operation... Two Club Members took up the offer from Cyclist Tom to have CPD units installed onto their bikes at-cost. We successfully applied for a Community Road Safety Grant, to fund a car bumper sticker and poster design competition. This project draws on a creative response to Safe Passing Distance and the road rule exemptions (drivers can cross unbroken lines and cross flat traffic islands, in order to comply with the MPD law, when it is safe to do so). We are partnering with the NSW Centre for Road Safety on this exciting and colourful project. Transport for NSW has awarded $10,000 for holding this bumper sticker and poster design competition. This project encourages new messages and images, which promote Road Safety... There are several categories, open to both children and adults. The launch and closing dates will aim to attract as many entries as possible. Stay tuned!! The Marginal Seat Campaign targets 24 electorates that are likely to decide the NSW State Election on 23 March 2019. By linking up with Cycling Clubs, Bicycle User Groups and Bike Shops we have facilitated a stronger voice for cyclists via lobbying resources (such as pre-filled letter templates, which take less than five minutes to write and send). Meetings with politicians, NSW Police, transport bureaucrats, cycling groups and others. This includes participation at the Australian Bicycle Summit and the Cycling Round Table, as well as working constructively with other Cycling Clubs, Bicycle User Groups and representative bodies (such as Cycling NSW, Bicycle NSW, Bicycle Network, Amy Gillett Foundation, Cycling Australia, We Ride Australia, Bicycles Network Australia and the Australian Cycle Alliance). Dulwich Hill Bicycle Club actively participated in the Cycling Round Table at Parliament House, hosted by the Member for Balmain (Jamie Parker) and Member for Newtown (Jenny Leong). As well as sharing information, we learnt about successful strategies that other lobby groups have used. We also narrowed down to three key state-level goals for bike riders: achieving a large increase in cycling infrastructure spend; improved Road Safety with a specific focus on Safe Passing Distance; and boosting the participation of children (who are the future of both cycling and our community). "Australian cycling organisations have joined in a call to all states to conduct enforcement campaigns with the primary goal of education and raising awareness of the importance of leaving a safe distance when passing bicycle riders, supported by a visible demonstration by Police of the legitimacy of bicycle riders on roads."